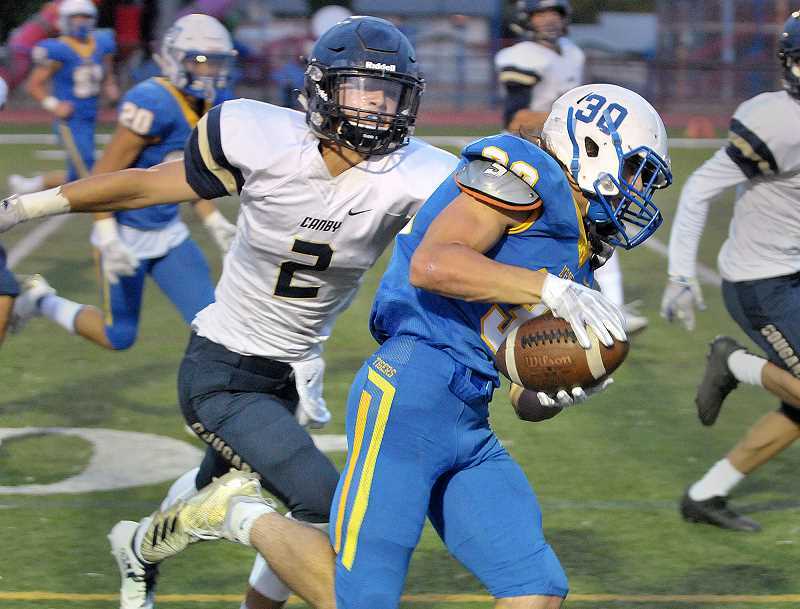 Using the same script it followed in a 28-0 victory over Grant in Week Two, the Newberg High School football team jumped out to an early lead over Canby and leaned on its defense to grind out a 20-7 win Friday night. "Our defense has stepped up," NHS coach Kevin Hastin said. "We had a great week of practice and defense was huge tonight. I'm really pleased with the effort on defense. Offensively, Canby was tough. They stopped us at times and are a tough team. We wanted to punch them in the mouth, but they just kept coming back. A lot of credit to them." For the second time in two contests at Loran Douglas Field, the Tigers marched down the field to score on their opening possession of the game, this time getting 59 yards on four carries from Matthew Larson, who scored from two yards out to make it a 6-0 game 5:30 into the opening quarter. Newberg successfully recovered an onside kick after the score, but the Cougars stiffened on defense and forced a turnover on downs at their own 39 yard-line. The two teams traded the ball back and forth, either on fourth down stops or punts, for the next three possessions before Newberg broke through for its first passing touchdown of the season. Facing second down and five, senior quarterback Gage Wright hit Owen Hawley over the top for a 35-yard score. Running back Justin Holtan converted the two-point conversion to make it 14-0 with 2:07 remaining before halftime. The Tigers went to that well again on their first drive of the second half and got a fortunate bounce to pull ahead 20-0 less than five minutes into the third quarter. "We're not going to take a ton of shots, but when we do, we have to make the play," Hastin said. "There were a couple of times we took shots last week and we didn't make the play. That was the difference in this game." Canby had actually stopped Newberg on third down, but chose to accept a holding penalty to push the Tigers back to the 50-yard line. With little to lose, Wright floated a ball down the right sideline for wide receiver Truman Connelly, who had gotten behind his man. The ball was a bit underthrown, but went off the hands of a Cougar defensive back and directly to Connelly, who raced the final 15 yards into the end zone. Connelly had a similar moment in the win over Grant in which a fumble bounced right into his hands, allowing him to run untouched for a special teams score. "There's something about playing on this field," Connelly said. "I honestly didn't see the ball until the second right before it hit me. It just bounced off his hands and I kind of grabbed it with one hand." Canby never threw in the towel, though, and got on the board late in the third quarter after Newberg had to punt out of its own end zone. Senior quarterback Trent Wakefield broke loose for a 23-yard scramble to get the Cougars in scoring position, then scored on a one-yard plunge three plays later to make it 20-7. It looked like Canby might storm back into the game after Jayden Brewer intercepted a Wright pass, but NHS sophomore defensive back Armen Tarakhchyan forced a fumble two plays later to stave off that threat. Newberg struggled to move the ball for much of the second half and turned the ball over on downs to give the visitors one more shot to get back in the game. The Cougars drove all the way to the Tigers' nine yard line, but a pair of incomplete passes killed the drive. "We really challenged our secondary this week," Hastin said. "I thought our secondary stepped up and played the ball well. We were in their lanes and we had one pick and were close to having four. I thought we covered well." 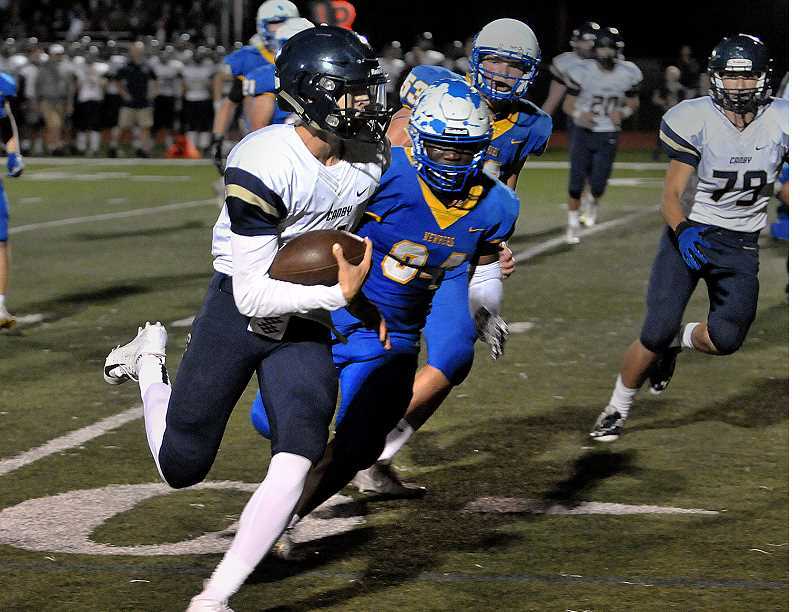 Newberg then killed the clock by feeding the ball to senior fullback Lawrence Lundgren, who rumbled for a pair of first downs to close out the game. He finished with 123 yards rushing on 24 carries to help the Tigers compile 280 yards on the ground and 400 yards of total offense compared to 252 for the Cougars. "We knew their defense was trying to take away Holtan," Hastin said. "They were wide and we rode Lawrence. He got some tough yards and a couple of first downs that really sealed the game." Newberg (2-2) will have one more nonconference game next week at Reynolds before opening up Pacific Conference play at home versus Century Oct. 5. With two wins in two games, this season already feels different than a year ago, when the Tigers were in their first year under Hastin and had to slog their way through the brutal Three Rivers League. "We've got heart this year," Lundgren said. "This is a whole new wave." Hastin said there is a simple explanation for the team's growth and is excited to see how it performs in the new-look Pacific Conference. "I think we've had an offseason to invest," Hastin said. "When you do that, it means more to the kids, so when you get down and it gets hard, they persevere. I'm seeing that. I want you to compete your tail off no matter what. I saw that last week and that was a positive. There were times when it looked like Canby was going to sneak back into it, but our guys wouldn't let it happen. They just bared down."